Nothing is a stronger symbol of warmth, togetherness, community, and tradition than the hearth, a place where loved ones can come together and share in warmth, food and drink in the spirit of a tradition that is older than civilization itself. Houston outdoor fireplace… a great place to gather with guests. The open fire extends your options for cold-weather, nighttime activities to the outdoors, allowing your loved ones to take advantage of the warmth so you aren’t forced to retreat indoors when the cold comes rolling in. The glow from a Houston outdoor fireplace also provides a certain ambiance that simply can’t be replicated indoors. With the right patio or deck, a Houston outdoor fireplace can create a perfect stage for your outdoor furniture… a beautiful backdrop for many magical evenings to come. 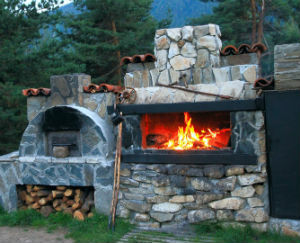 Houston outdoor fireplaces make excellent ovens! Roast marshmallows for s’mores with the family or cook an impressive fire-roasted meal for friends and colleagues, then gather round and enjoy the bounty of a delicious and ancient cooking method! 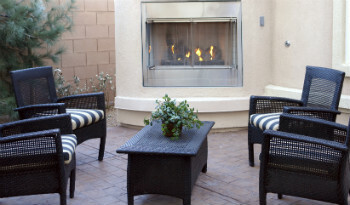 Nothing provides more “wow” factor to a lackluster outdoor space than an outdoor fireplace. No outdoor living space is complete without an outdoor fireplace to go with your outdoor kitchen. You have been fighting off the heat for what seems like forever… now is the time to put on a comfortable long sleeve shirt, grab your favorite beverage, and just relax!